Chocolate, caramel, nuts, custard. I sometimes joke that my heart is torn between these four great loves of my life, at least when it comes to dessert. While other people are happy never deviating from their one favorite flavor (my dad, for example used to ignore the rest of the menu if there was anything containing lemon on it), I can spend hours weighing the relative merits of a dessert menu that forces me to choose between a pot de crème and an almond tart. To be perfectly honest, I don’t think I am entirely to blame for this; I suspect there may be a touch of astrology muddying the waters as well. I have the peculiar fortune (or misfortune, depending on how you look at it), to have been born during a solar eclipse, a rare alignment of the sun and moon – the two most important astrological determiners, supposedly – in which both are briefly to be found in the same slice of the celestial pie. According to experts, the condition that results from this rare convergence is an effective doubling of the characteristics of that sign on the individual. Having been born exactly at the moment these two crossed paths in the house of Libra, I acquired in exaggerated form everything that Librans are typically known for, including plenty of optimism, diplomacy, and unfortunately, the crippling inability to make decisions. My decision disability (or, as my dear husband likes to call it, my ‘decision neurosis’) strikes me often, and usually in the most inconvenient of situations – situations which, now that I reflect on it, seem to usually concern food: supermarkets, restaurants, ice cream counters, and in front of the menu for the Indian take-out place down the street. It can be as simple as not being able to decide whether I should buy raspberry or plum jam while doing my weekly shopping, or it can be as difficult as standing at the sandwich counter knowing I have to choose between thirty different fillings before the people waiting behind me start to contemplate attacking me with sharp objects. Considering my sweet tooth, however, no decisions are as difficult as the ones that concern dessert, and thus you can imagine what a relief it is to not have to make them at all. For me, the holy grail of dessert menus is one that offers me something that combines at least two of my favorite things, in which case I can let simple numerical weighting do the job: for example, anything that contains chocolate and nuts would naturally trump custard alone. Offer me a dessert that contains three of the four, and I’ve decided what I want even before the menu hits the table. Combine all four, and well… chances are I have a brand-new favorite dessert, and chances are, these days its name is probably bônet. Let me tell you a little bit about my love affair with bônet. I was casually browsing Italian recipes online, not even looking for a dessert at all, when I happened upon someone’s account of a meal they’d had in Piemonte, that green and mountainous corner of Italy sandwiched between France and Switzerland. 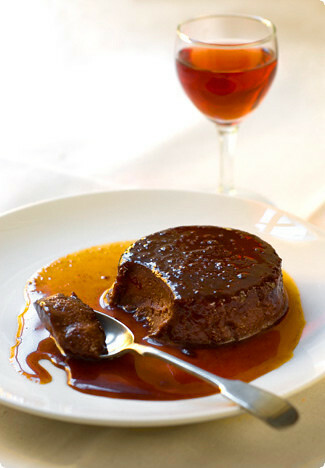 The writer praised all the food highly, but especially recommended the dessert, a caramelized chocolate and almond custard supposedly typical of this region. Now, I don’t know about you, but when I run across a description of a dish that a) I have never heard of before, particularly from a cuisine I thought I knew inside-out, and b) contains all of my favorite things, the rest of the world’s demands on my time seem to magically melt away until I have learned everything I can about this mysterious delicacy. In my research, I learned that bônet is a dessert of long-standing tradition in this part of Italy, the type of thing that if you were lucky enough to be born here, would have been made for you by your nonna on a regular basis. It’s a homely, rustic dessert, and thus carries along with it all the connotations inherent to this genre, namely, a multitude of variations and strong opinions on whose version is best. The basic concept of a bônet, though, is constant and is probably what flan would be if I had invented it myself. At its most fundamental it’s a custard baked inside a caramel-lined mold – but not just any custard, one that has been buoyed by chocolate and pebbled with nutty crumbs of amaretti, all of it soused in a generous glug of booze. It can support additional flavorings as well – there are recipes including a few drops of espresso, or the grated rind of a lemon; some call for only milk and others for cream. A lone recipe even spices up the mix with cinnamon. The booze component ranges from dark rum to Amaretto, and occasionally seems to be forgotten entirely. The version I finally decided to make, strikes, to my taste, the perfect balance between simplicity and sophistication. I decided to forego what I considered the distracting flavors like coffee and lemon, in favor of letting the chocolate and almond stand up for themselves. I added cream for unctuousness, just enough eggs to solidify it, and the haunting perfume of sweet Marsala (an admittedly untraditional touch), whose indescribable fragrance penetrates its wobbly magnificence to the core. The result is a dessert that combines my four favorite things in such perfectly balanced proportions that it somehow manages to even exceed the sum of its parts. It’s quite simply – and I don’t say this lightly – one of the most delicious desserts I’ve ever eaten. It’s just a pity bônet is so scarcely known – if only it found its way onto dessert menus more often, so many of my decisions would be already be made. I’m very partial to the flavor of Marsala in this recipe, but if you can’t find any or can’t justify buying a bottle just for this, please feel free to substitute just about anything you feel like. Rum is the traditional choice, but if you’re willing to deviate from tradition, the possibilities are nearly endless – Amaretto, Cognac, Grand Marnier and Kahlua all spring to mind as possible alternatives. Source: Although I consulted many recipes, the one I ended up loosely basing my proportions on is Cindy Mushnet’s version in Desserts: Mediterranean Flavors, California Style. First, make the caramel. Place the water in a medium saucepan, pour the sugar into the center of the pan (this helps prevent crystallization later), and set the pan over medium heat. Swirl the pan frequently until the sugar has dissolved and the liquid is clear. Turn the heat to high and boil rapidly, swirling the pan occasionally (do not stir) so the sugar cooks evenly, until it turns a deep amber brown. Don’t be tempted to take it off too soon – the flavor will be weak. It may smell a little burnt by this stage, but it will still taste fantastic (trust chocolatier Michael Recchiuti, whose signature flavor is burnt caramel!). Remove the pan from the heat and immediately pour the caramel into the custard cups. Working quickly, swirl each cup to distribute the caramel evenly around the bottom and sides, about an inch up from the bottom–be careful, the caramel is very hot. Set the cups in a roasting pan large enough to hold them all. Preheat the oven to 325F/160C. Position an oven rack in the center of the oven. To make the custard, place the cream and milk in a small saucepan over medium heat and bring to just below a boil. In a medium bowl, whisk together the egg yolks, whole eggs, sugar and salt. Sift the cocoa powder over the top and whisk until well blended. Slowly whisk the hot cream into the yolk mixture and blend well. Pour the mixture through a fine strainer into a pitcher or large measuring cup with a spout. Stir in the crushed amaretti cookies and the Marsala. Divide the warm custard among the caramelized custard cups. Place the pan in the oven, then pour enough hot water into the pan to come halfway up the sides of the cups. Cover the pan with foil and crimp it loosely around the edges (don’t make it airtight). Bake just until the centers of the custards are barely set, about 45 minutes to an hour (they will jiggle like jell-o instead of looking liquidy). Use a pair of tongs (or your hand protected with a kitchen towel) to immediately remove the cups from the pan and place them on a rack to cool, about 40 minutes. Refrigerate, covered with plastic wrap, for at least 6 hours or overnight before serving. To unmold the custards, run a thin, sharp, flexible knife around the edges of each cup. Fill the roasting pan with about 1/2 inch of boiling water, and set the cups inside for a minute to loosen the caramel. Place a serving plate upside down on top of each cup, then, holding the two together, flip the plate right side up – the custard should slide out of the cup and onto the plate. If the custard is a bit hesitant, pick up the plate, hold the cup in place on the plate, and give the two a firm but gentle shake once or twice. If there is still a good bit of caramel hardened to the bottom of the cups, add a tablespoon of water and heat the cups in the microwave (or set inside a larger pan with a bit of water inside on the stovetop) until the caramel all melts. Believe me, this stuff is too good to waste. The custards may be baked up to 2 days in advance. Store in the refrigerator, covered with plastic wrap. I love the same flavours and the result seems so beautifully inviting. I never tried any custard except the classic crem caramel, but your recipe will be on my list. Have to find Marsala now…congratulations! It does sound like a chocolate creme caramel! I have to try it – it looks so incredibly yummy! Thanks for posting this. Melissa, you know you’ve made a creamy dessert sound and look irresistable if you can make it appeal to someone with a cold. Or maybe I’m just a glutton? Either way, I know what dessert I want to make when I get better! I’m also curious about the derivation of the word, though. And the pronounciation. Is the T pronounced or is it silent, like in French? Ah, so you’re a Libran also. That explains so much. S hates that I’m so indecisive, suggesting we make one thing, and then after she agrees, suggesting something else. This dessert, though, sounds fabulous. I’ve never heard of it before either. Thanks for the lesson. This looks and sounds very rich and indulgent! Great photo! I never liked custards or anything too jiggly, but I do identify with your father (I adore anything citrus) and your problems at a restaurant. Whenever I can I try to download the menu first, this saves my fiancé a lot of raised-eyebrow inpatient looks. Nothing I can do here though. Thanks for the post it made me laugh.laugh. Hola Melissa, I popped in once or twice before to check your site out before I vote for the Food Blog Awards! First off, kudos to all the details you have put into writing and photographing for each of your post. I live in Barcelona at the moment and my favorite flan is a homemade Dulce de Leche version made by an argentinian cooperative restaurant named Bascula. (Which city in Spain did you live in btw?) This is the first time I’ve heard of an italian choc version of a flan. If you’re ever in Barcelona, I know another good place for sweet things like there… crema catalana post. Melissa,Stunning! I had never heard of this dessert until I read your post. (By the way I completely understand your indecision when it comes to dessert … it the most important part of the meal! ).And caramel and nuts are my idea of dessert glory. Thank you for this bit of inspiration! Melissa, this is Yummy 🙂 Bravo..I would eat it right now even before 7am. You’re the Chef! I did vote for you too..I wish you good luck, and please let me know if you win. Great work. Btw, Is it ok to include you in my Friends section as one of my fave blogs? I will definitely look up Italian desserts more after seeing this!It is exactly what I was missing when making Custard tart. A little twist – and a new dessert.Really good! Oooooh, this sounds like a lovely dessert, Melissa..I’m terrible at making decisions too, esp when it comes to food. I will ask my husband to choose something nice for me if I’m not up to debating the pleasures of one dish over the next! (he gets worried about choosing the wrong thing tho’ LOL). This looks incredible. I have recently been on a pressure-cooker experimentation binge, and have found I can make a perfect creme caramel in ten minutes. I am going to see if it works with this; I see no reason why not! My mother makes a Burnt Sugar Cake–she starts with a cup of sugar in a cast iron skillet (she said it has to be cast iron), and heats it until it caramelizes. No liquid at first, just burning (carmelizing) sugar. She then adds water, which after a great deal of stirring, dissolves the burnt sugar and makes a base liquid for the cake. This is repeated for the frosting, which has the consistency of fudge. Your description of caramelizing the sugar reminded me of her recipe. Sounds positively decadent. This sounds deicious & have never heard of it either. Can sort of relate to you on menu choice as well, I cant pick a favorite flavour & am always tortured to limit myself to one entree, main & dessert as I always want it all – to compensate I usually steal tastes of my hubbies dishes too! Just as a note, the well-salted caramel tart you wrote of earlier isn’t listed in your recipe list. I did a search for it, and found it though! I’m thinking about making it when I have the facilities available (dorms do not bode well for cooking). I can attest to the fact that is a traditional Piemontese dessert. I am living in Torino and have seen this on almost all menus. You can also get bonet in the grocery store, all pre-made and ready to slice. Usually it is made is a loaf style and slices are served with drizzles of the caramel. Hi Melissa, I’ve never heard – or had – bonet before, but judging from the ingredients, it’s definitely something I’d like. I’ll keep my eyes open next time in Italy! Hi Tülin – I think if you like crème caramel, and of course if you like chocolate, you’ll certainly like this. Thank you, and enjoy!Hi Bea – Of course I don’t mind the linguistic questions, after all I’m a linguist myself! 🙂 I can’t find much information regarding the name, but I do know that it’s probably a Piemontese word. Piemontese is now recognized as one of Italy’s ‘regional languages’ by many linguists as it differs quite substantially from standard Italian. It apparently shares similarities with other Franco-Provençal languages as well as standard French. Here’s the wikipedia page on it: http://en.wikipedia.org/wiki/Piemontese_languageUnfortunately I don’t know for sure if the cirumflex is accurate – I’ve seen it spelled both with and without it, but I think it somehow adds an irresistible sophistication!Hi EP – Why thank you, and I look forward to seeing you again! In all honesty, though, there are no guts required for making this dish – it looks much more complicated than it actually is 🙂 Hi Pru – Thanks!Ah, Paz, I had forgotten you are a fellow Libran. You obviously know exactly what I’m talking about!Hi MM – It is, but better! Let me know how it turns out if you give it a try.Hi Brett – I think I know the explanation, and it has nothing to do with gluttony – your body simply thinks all those extra calories would help fuel the offensive against that virus! And I’m inclined to agree. As for your question, take a look at the wikipedia page I mention in my response to Bea’s comment above. Although I’ve never heard it pronounced myself, one recipe gave this phonetic transcription: bow-NET. If anybody wants to refute this, give me a shout.Hi Chubby Hubby – Ah yes, we Librans are so misunderstood. Perhaps you should remind your dear wife that while it is indeed frustrating that we are so indecisive, Librans have more than our fair share of good qualities that tip the scale more than slightly in the other direction!Hi J – I’m almost too embarassed to admit it, but I’ve even been known to order four flavors and then ask if they can ‘split the scoops’, thus allowing me to sample eight for the same price! And yes, Recchiuti’s caramel ice cream is high on my list, though right next to it is Pierre Herme’s caramel ice cream from the Cook’s Book… I wonder who will win out?Hi Kat & Satoshi – Thank you, and yes it certainly is (whether or not that counts as a good thing in your book! ;)Hi Katy – Hmm, I don’t know if I’d describe this as jiggly — it’s more of a dense, creamy sort of consistency with the merest hint of a wobble, if that sounds any better to you 😉 But I totally understand about the appeal of online menus – unfortunately they’re pretty rare here as well!Hola Kel – Thank you for all your kind words! Barcelona has always been one of my most favorite cities in the world, and has some of the most fantastic food to boot (or maybe that’s why I like it?). I lived in the Basque Country, near Bilbao, many years ago. Although I don’t make it back to Spain very often these days, I’ll be sure to remember what you said about Bascula, as I love dulce de leche too!Hi Ivonne – Absolutely, it is without a doubt the most important part of the meal! I’ve even been known to be unable to enjoy the rest of a meal if I know there’s no dessert coming at the end…Hi Maya – Mmm, bonet for breakfast, sounds good to me 🙂 Thanks so much for your votes (I didn’t win anything, unfortunately), and of course I’d be honored to be included on your list of favorite blogs!Hi Dreska – It is the little twist that often differentiates a boring dish from an extraordinary one, isn’t it? I must admit to often being bored by crème caramel which is why I was so excited to find this variation. If you try it, let me know what you think!Hi Cin – Thanks! And I’ve also tried the ‘letting someone decide for me’ route, but unfortunately it always seems to backfire – mainly because I can’t hide my disappointment when a dessert is bad, and nobody wants to risk shouldering that kind of blame!Hi Michele – Hmm, a scorpio with a decision problem — are you sure there’s no chance that your parents lied about your birthdate? Or maybe you were adopted and they didn’t know the real date so just made one up? I think there’s only one way to settle this: next time we go to a restaurant together I’ll bring along a stopwatch and we’ll see who has the bigger decision problem! ;)Hi Luisa – Aw, glad you like the look of it! And hey, you’re the one in New York – I’ll gladly talk to any literary agent you send my way! ;)Hi Pru – Wow, I can’t wait to hear the outcome! If it works, I may just have to invest in a pressure cooker myself…Hi David – That flight was all sold out, I swear! No, really, I’m not just saying that because I wanted the leftovers all to myself! Okay, maybe I am.Hi Jessica – Oh yes, you know I can’t live without it! 🙂 And thanks for the tag – unfortunately this site is starting to look like the scene of a vast meme-o-cide as many have been coming here recently only to die. I’ll try to get to this one before it meets the same fate as the others!Hi Cyndi – Wow, very interesting cake – it sounds delicious. I’d love to have the exact recipe if you think your mother wouldn’t mind you giving away her secrets!Hi Ange – Oh yes, that sounds familiar — I virtually forbid my poor husband to order the same thing as me every time we eat out, just so I can taste as many things as possible!Hi Lys – Thanks for the heads-up, I’ve added it to the list! And I can certainly sympathize about the constraints of dorm kitchens – I have suffered through far too many of those dark years myself.Hi Gia – Fantastic, thanks for the accuracy check! Have you tried either restaurant or supermarket versions yourself? I’m very curious how mine might compare. Maybe it’s time for a little research in the field!Hi Pille – Isn’t it wonderful that there are still so many foods out there to discover? Do let me know if you find it in Italy, I know I’ll be looking high and low for it next time I go! Hi Melissa,This looks great! I will definitely try it out.By the way, a tip for helping avoid crystallization when making caramel: Add a very small amount (1 tbsp, perhaps) of corn syrup to the mix. I don’t understand the science behind why it works, but apparently because the corn syrup is a different kind of sugar than table sugar (fructose vs. sucrose?) it helps to avoid the molecules of table sugar binding together. Whooooo, Dayum! Thanks for finding this. Daddy gotta try! I made bonets for today – had no marsala so used Kahlua instead. They were fabulous. Easy to make but really impressive and sooo delicious. I’ll definitely be returning to this recipe. now sugar LOW friday is over,maybe i can make this. But, oh, I forgot I am on a diet, darn. Hi Adam – You’re right, corn syrup or liquid glucose help prevent crystallization. I was curious, so I looked up an explanation of this. Here’s what I found (from http://www.baking911.com/candy/101_crystallization.htm ): "You’ll sometimes see an interferring agent(s) used in candy recipes to help stop premature crystallization and to affect the size and amount of crystals that form when the sugar recrystallizes. One way to prevent the crystallization of sucrose in candy is to make sure that there are other types of sugar—usually, fructose and glucose—to get in the way. Large crystals of sucrose have a harder time forming when molecules of fructose and glucose are around. Crystals form something like Legos locking together, except that instead of Lego pieces, there are molecules. If some of the molecules are a different size and shape, they won’t fit together, and a crystal doesn’t form." Fascinating!Hi Jbob – Thank you, I hope you like them!Hi Hilary – Wonderful! I’m so glad you liked them. I may have to try the version with Kahlua myself :)Hi Sam – Yeah, I can see that this doesn’t really qualify as diet food. Not that I’m one to deliberately undermine your diet, but if you happened to find yourself with some points to spare, I can’t think of a better way to spend them! Hi Melissa! !Thanks to you and your beautiful pic, i also made this really tasty dessert with homemade amaretti, only that I used a simpler recipe. And it’s funny because i’ve spent so many years in North Italy for holidays and I just had never heard about the bonet!! I was so enchanted i made another batch of amaretti.. just to have the pleasure to taste bonet again. Thank you!!!!!! Melissa,Have you seen the recipe for creme brulee ice cream in Pierre Herme’s dessert cookbook? I just made it and it’s wonderfully caramelly! Although the procedure is a bit more complicated – I don’t know how much it differs from the straightforward caramel ice cream recipe in the Cook’s Book. Wow, as I STUMBLE through the churning sea of honest-to-goodness food-blogs and medoicre gastronomical whimsy, I’m blown away by the depth, quality, beauty and downright solid entertainment and ideas I’m getting out of this website! This dessert sounds amazing (like it needs to be said again! )!As for the Libran comments, I too am a Libra and absolutely curious to know what year you were born in?! The "decision-making" characteristics hit far too close to home. – hah hah!Keep up the amazing work.Salut! Bèrto, thanks very much for the spelling, pronunciation and historical clarifications. I had a very hard time finding any information in English about this dessert, so this is much appreciated. And I can confirm that it is very easy to make – and of course also very, very good! There is a wonderful chapter on the food of the Piedmont in a book called Remarkable Feasts, by Leslie Forbes, an English author. I believe a recipe for this dessert is included (I don’t have the book in front of me, but I remember a recipe for a chocolate-caramel custard), as well as many other delicious-sounding things.